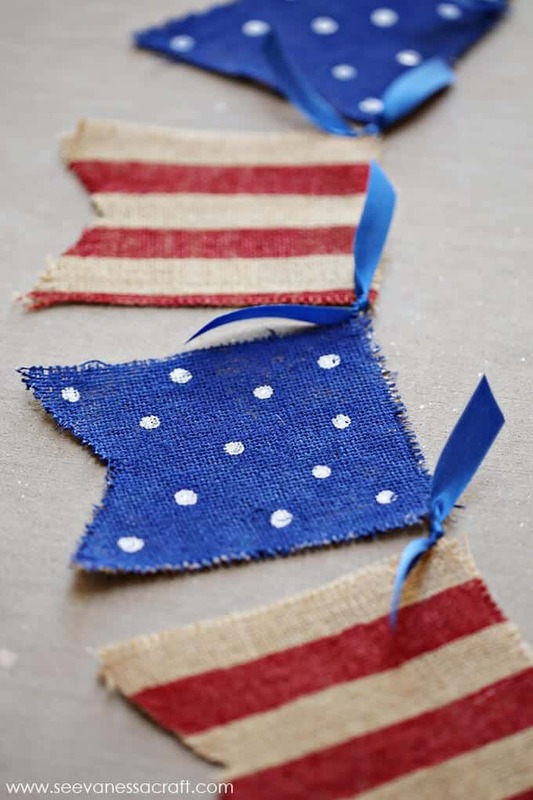 Whether it’s Memorial Day, the 4th of July or you’re just proud to be an American, sometimes you need a little patriotic decor to liven up your home. 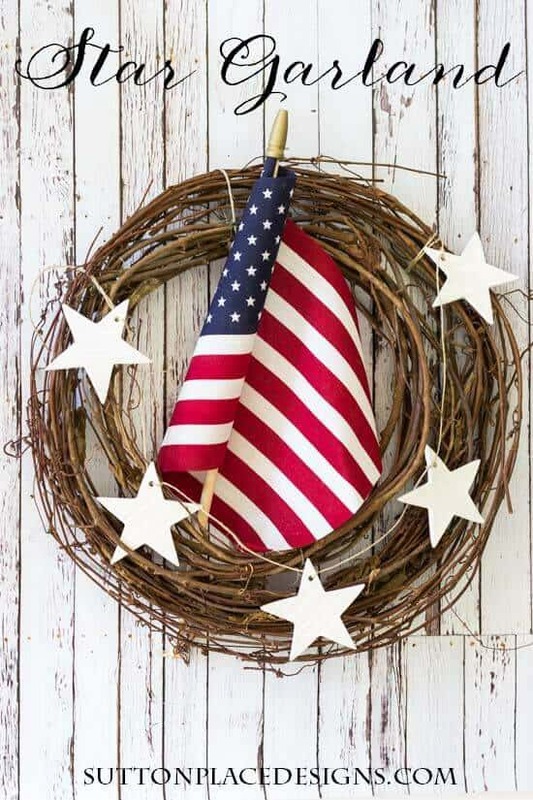 Sometimes just a few well-intentioned pieces will give your home the look it needs to celebrate the many reasons America is pretty great. 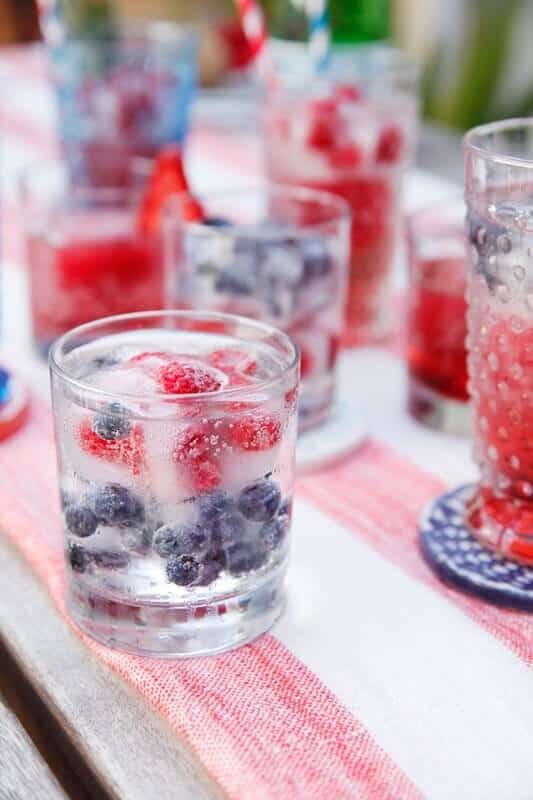 Check out this list of simple ways to incorporate some red, white and blue! This framed print of a piece of God Bless America is a great way to add some understated patriotism to your mantle. It’s a beautiful homage to our great land, and has just enough of our country’s colors to be festive, but not overdone. 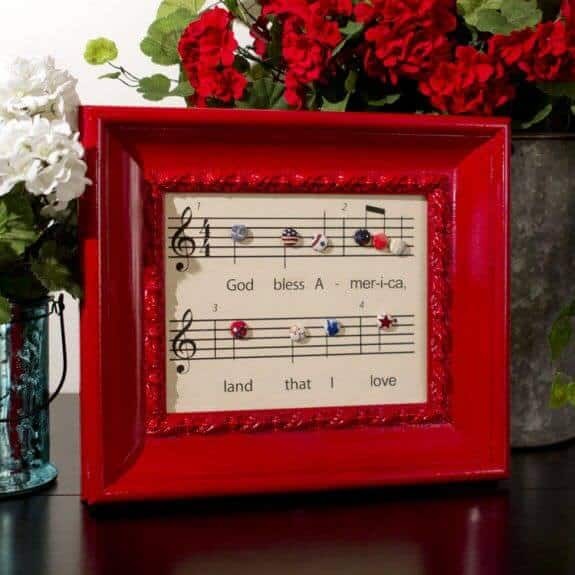 You can create your own buttons, or use pre-made ones to accent the musical notes to add just a little more zest. Before you get worried about where you’re going to find a copy of God Bless America, head over to InfarrantlyCreative.net to download this free section! 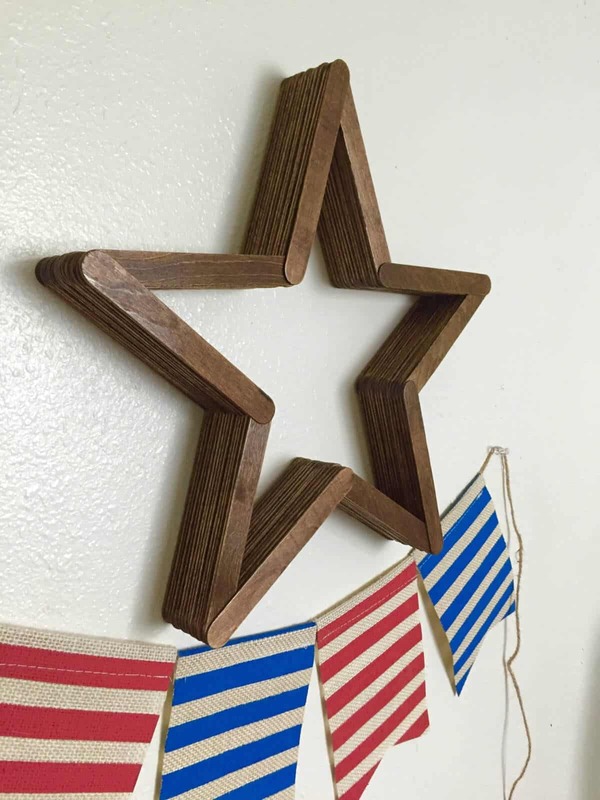 Decorative wood blocks for your front porch are very popular, and with this patriotic version, your porch is going to be the prettiest in the neighborhood. 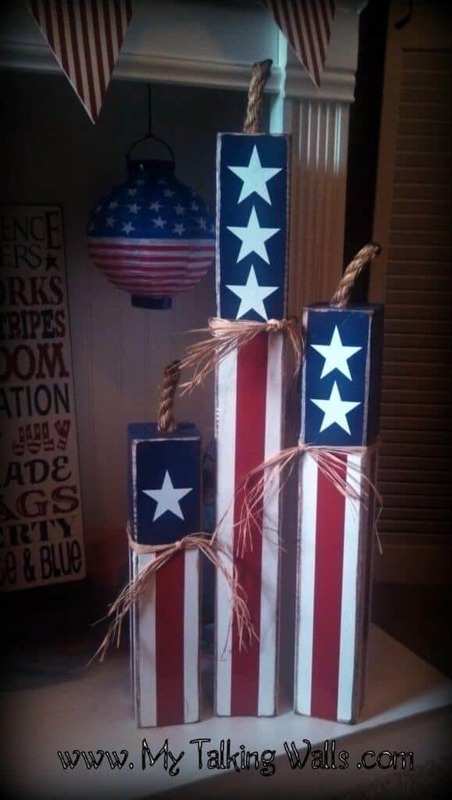 These wooden blocks are painted not only to mimic the look of the Grand Ole Flag, but with the added piece of rope up top, they resemble a firecracker too! 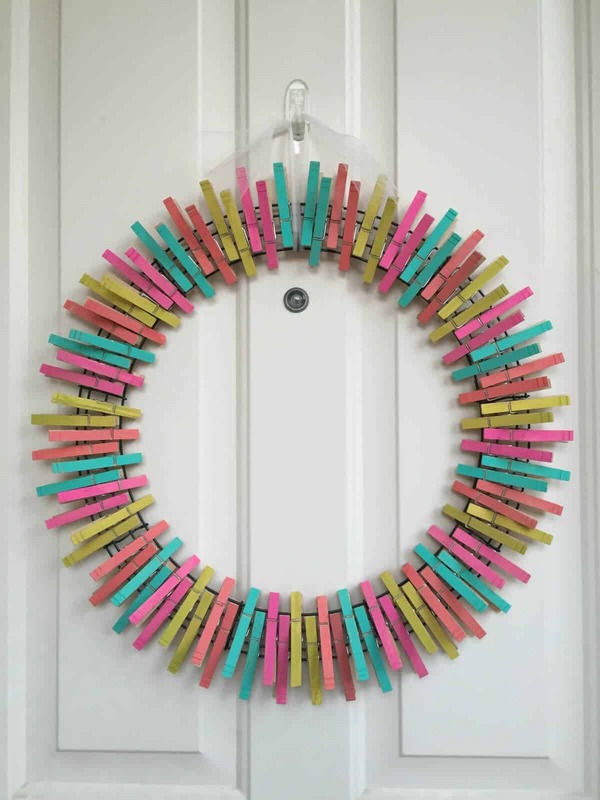 If you want this idea for your own, visit MyTalkingWalls.blogspot.com for a tutorial. You can also find others all over Pinterest! Tissue paper tassels are super trendy right and they’re great for making inexpensive, yet stylish decor for your home. The great thing about them is you can customize your colors and make them as large or small as you want. I love the one pictured above because while it uses red, white and blue colors, they are not in traditional patterns like stars. What an easy way to dress up a mantle! 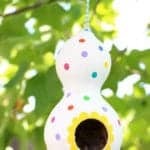 LandeeSeeLandeeDoo.com has an easy tutorial you don’t want to miss. 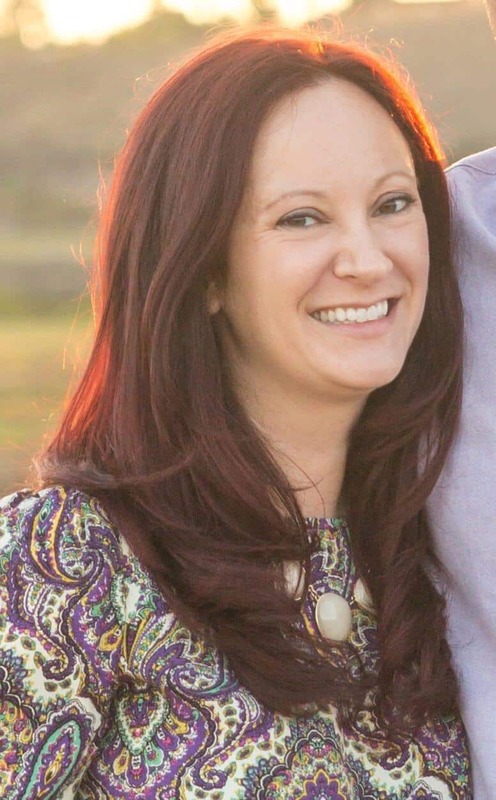 You should also check out her great Etsy shop! You didn’t think we’d have a post on decor without at least 1 mason jar idea, did you? 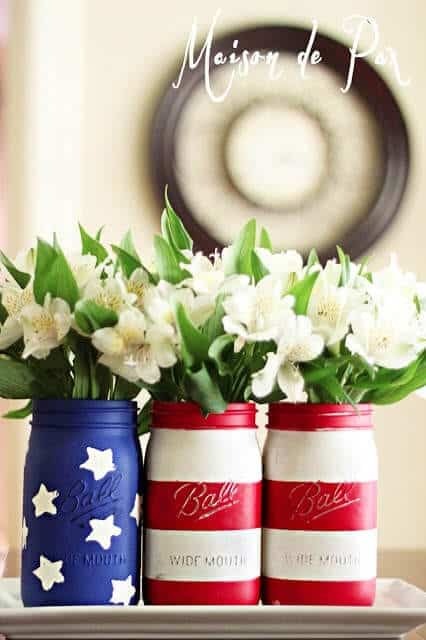 Even if your house isn’t “shabby chic” or country-inspired, you can still craft and display these simply gorgeous and patriotic vases. 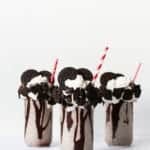 The best part is that mason jars are inexpensive, and because they always seem to have a rustic look, you don’t have to be perfect in your crafting. Get over to MaisonDePax right away to see the tutorial on making your own mason jar vases. You’ll also find other beautiful design ideas you don’t want to miss! 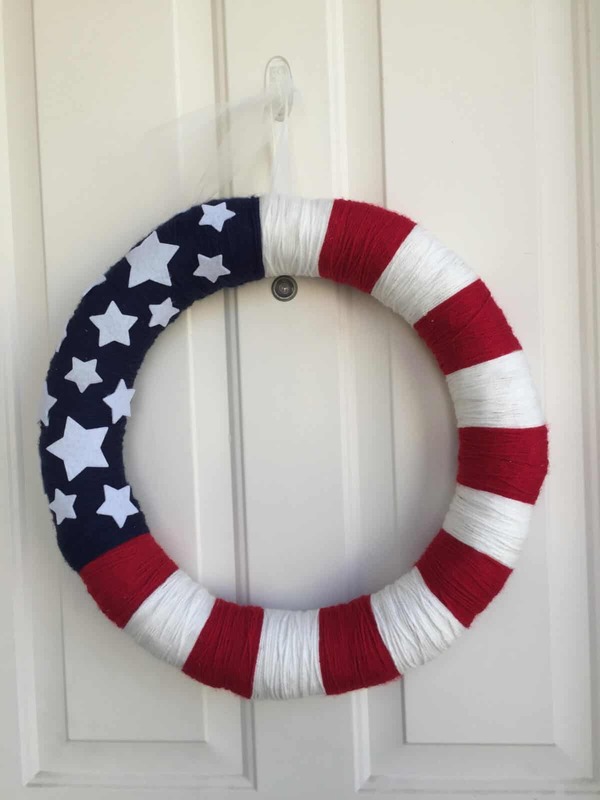 Another must have for your patriotic decor is a wreath. This design is simple, yet stunning. Grapevine wreaths are inexpensive, yet have so much texture they make the best wreath forms around. 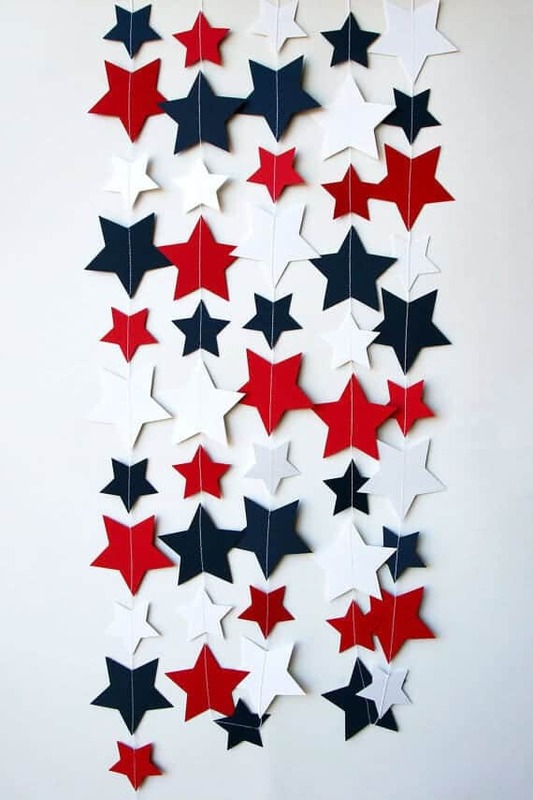 I love that this design puts the American Flag as the focal point, and the clay star garland pays even more homage to the stars of our flag. This design came from OnSuttonPlace.com, where you can also purchase the clay stars! Check out the site for beautiful design ideas for any home. 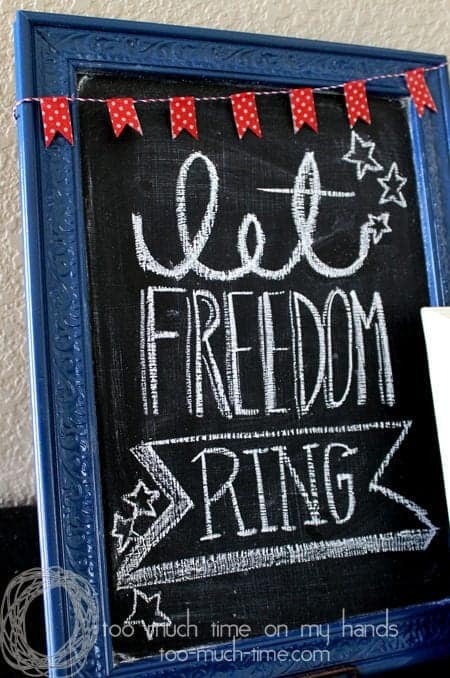 As far as I know, chalkboards are still “in,” and that’s why you need this patriotic version! You can actually use an existing chalkboard around the house, or finally just use this as the push you need to make one for yourself. 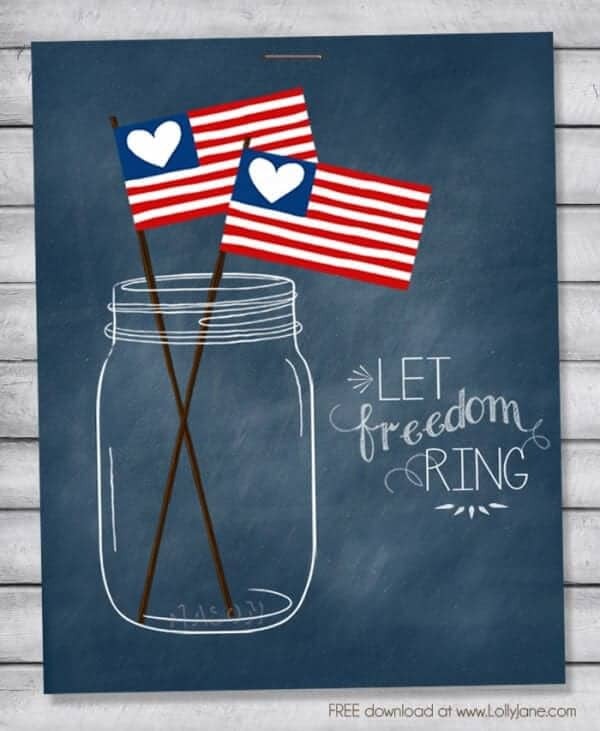 Add a festive message and you’re already in the patriotic spirit! Too-Much-Time.com has this great tutorial, and other info on crafts, essential oils and cooking. I love the idea of a seasonal table runner because it adds just a bit of festivity (is that a word?) and can be easily stored during the off-months. 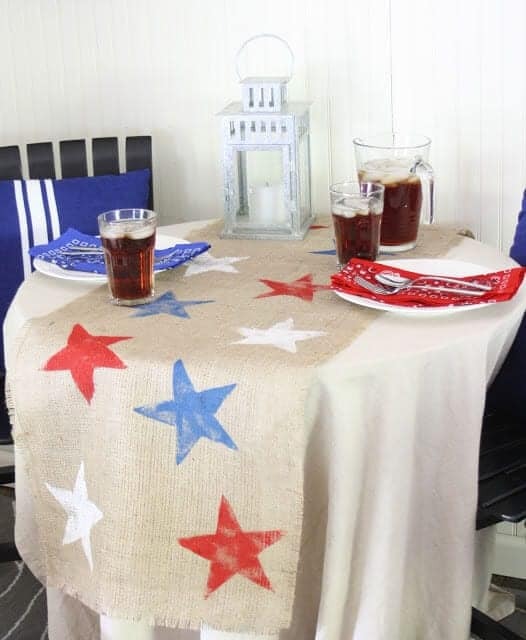 This burlap table runner is perfect for adding just a bit of texture and color. 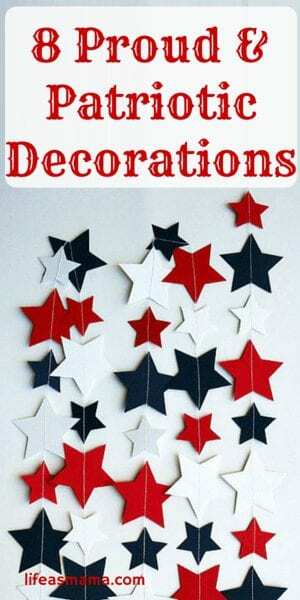 You can customize with whatever pattern and design you want, while still feeling patriotic at the same time. 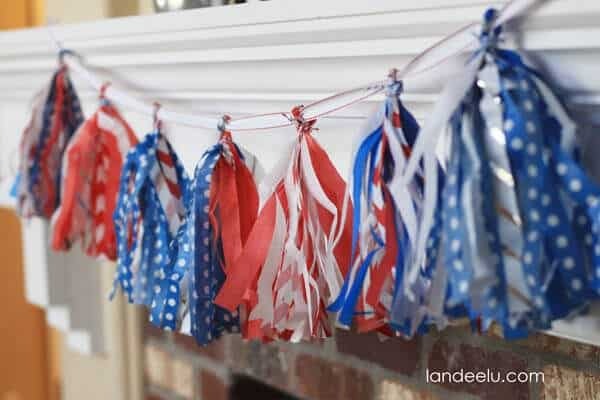 Because you can never have enough garland, here’s one more version that is simple, yet undoubtedly patriotic. This particular garland can be found on Etsy, but is simple enough to make on your own either by sewing the stars together, or sandwiching two together around some thread with glue. A great afternoon craft, if I do say so myself!